Product #21798 | SKU 1544648 | 0.0 (no ratings yet) Thanks for your rating! 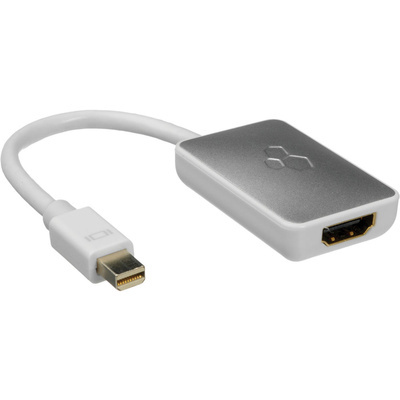 The Kanex iAdapt Mini Display Port to HDMI Adapter is a sleek cable that allows you to connect your mini DisplayPort or Thunderbolt enabled Apple computer to an HDTV, projector, AV receiver or other device with an HDMI input connection. When using the adapter with a Thunderbolt source, the higher data transfer speeds and video options of the Thunderbolt interface are not supported. Display content from your computer on a larger display, with 1080p capability for high quality resolution. It supports both video and audio output with a single cable, so it doesn't take up additional space and features a sleek design to complement any surroundings. Its compact size allows you to take it anywhere.